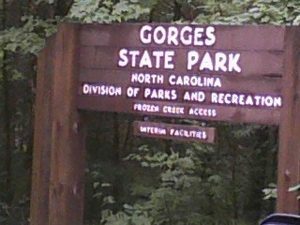 Gorges State Park, North Carolina’s Crown Jewel, is part of the natural area that National Geographic named as one of the 50 of the World’s Last GREAT Places – Destinations of a Lifetime. Plunging waterfalls, rugged river gorges and sheer rock walls await all Gorges State Park visitors. Gorges State Park appeals to those adventurers in search of pristine waterfalls and cascades. The Park is home to over 20 named falls and serves as the jumping off point for one of the most visited falls in western North Carolina, Rainbow Falls. Granted, reaching some of the Park’s water features may be demanding, but those who dare will no doubt be glad that they took the challenge. A swift elevation rise of 2,000 feet in four miles combined with annual rainfall in excess of 90 inches creates a breathtaking temperate rain forest which also plays host to rare and unique specimens of plants and amphibians. Public access to this remarkable landscape is thanks to a unique partnership of industry, the environmental community and the State of North Carolina formed during the spring of 1999. Gorges State Park also boasts a gold level, LEED certified Visitors Center. This exceptional building, built to national environmental standards, is home to an informative and interactive exhibit hall, a 75-person auditorium, a 40-person classroom, a covered wrap-around deck offering outstanding views of the Park, a cozy stone fireplace for cool winter days, and Park offices. Picnic shelters, restroom facilities and a newly constructed amphitheater also greet visitors to the Park. We have a newly-created loop trail from the Visitors Center for all ages and abilities.